The ancient Roman emperors were the rulers of the vast Roman Empire that stretched over three continents at its peak. It was an empire that stretched from Britain in the West to Syria in the East, including the Mediterranean region as well as Northern Africa. The emperors of ancient Rome were the central authority in the empire while the provinces were run by their governors who were directly answerable to the Senate. The power of the emperor lay in their control of the Roman army, meaning emperors often needed the support of the troops or the Roman Senate, or both. Essentialy the Roman emperors were likened to a king, although the disinction was clear that the emperors were not a monarchy which has already been tried and passed over in ancient Rome. Augustus Caesar was the first emperor of ancient Rome and one of the most famous among all emperors of ancient Rome. He was the adopted son of Julius Caesar who was assassinated in 44 BC. Augustus Caesar became the emperor of Rome in 27 BC and ruled until his death in 14 AD. His real name was Gaius Octavius and he belonged to the equestrian branch of the famous plebeian Octavii family. The Roman Empire during his reign expanded to include Egypt and this initiated the era of peace known as Pax Romana meaning ‘Roman Peace’. 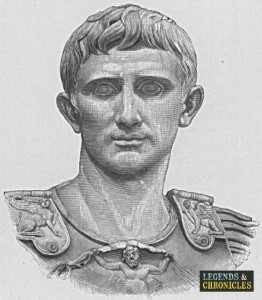 A drawing of famed Roman Emperor Augustus Ceasar. The history of the emperors of ancient Rome began with Augustus Caesar who ruled from 27 BC to 14 AD. After him, seven emperors from the same Julio-Claudian Dynasty ruled until 69 AD. These emperors of ancient Rome included Tiberius ruling from 14 AD to 37 AD; Caligula ruling from 37 AD to 41 AD; Claudius ruling from 41 AD to 54 AD; Nero ruling from 54 AD to 68 AD; Galba ruling from 68 AD to 69 AD and short periods of rule by the emperors Otho and Vitellius. This dynasty was followed by the Flavian Dynasty and Antonine Dynasty, after which the gradual decline of the Empire began. With the end of the Roman Republic and beginning of the Roman Empire, the powers of the emperors of ancient Rome significantly increased. The emperor was the permanent leader of the senate as well as of the religious office. He could enact and revoke the capital punishments and could veto any act proposed by magistrates. His duties included the overlooking of proceedings of the senate and also managing the affairs of the Roman provinces. The daily lives of the emperors of ancient Rome varied from emperor to emperor. Their day usually began with sunrise and they soon went to take care of official tasks since bathing was usually taken in the afternoon. Emperor Vespasian once bragged that he could go from sleep to work in 30 seconds. One of the most important components of the daily life of emperors of ancient Rome was the official correspondence between the emperors and their officials. The first Roman Emperor Augustus lived near the upper end of Scala Caci and the same place along with the adjacent properties remained the official residence of the emperors of ancient Rome over the reign of the next few emperors. Considerable extension of the residence was done during the reign of the successors of Augustus who acquired the adjacent properties and gave it the shape of a proper palace. But the grand palaces of the emperors of ancient Rome mainly began during the Flavian Dynasty when the Flavian Palace was built on the famous Palatine Hill. This was a large palace that extended across the Palatine Hill and overlooked the Circus Maximus. Of the many Roman leaders, some stand out from the crowd, you can almost call them pioneers for the way they helped to forge the Roman Empire of the time. We will detail some of these leaders below. Other than the first emperor Augustus, there are many other famous emperors of ancient Rome. For instance, Emperor Claudius was one of the most popular emperors of ancient Rome among the successor of Augustus. He was the emperor of ancient Rome from 41 AD to 54 AD and the first emperor of Rome who was born outside of Italy. He had physical disabilities such as limpness and slight deafness but still proved to be a relatively successful emperor. Upon the death of Emperor Claudius, he was succeeded by his grand-nephew and adopted son, Nero. Nero ruled from 54 AD to 68 AD and was the last emperor from the Julio-Claudian Dynasty. Nero’s reign saw a considerable enhancement in trade, diplomacy, and cultural life of Rome and various theatres were built during his reign. It was during his reign that the famous Great Fire of Rome destroyed most of the city, and while many Romans believed that it was Nero who started the fire, there is no conclusive evidence for that. He is also famous for persecuting Christians in the Roman Empire. A statue of the Roman Emperor Marcus Aurelius from the Musei Capitolini in Rome. One of the most famous emperors of ancient Rome was Vespasian who ruled Roman Empire from 69 AD to 79 AD. Vespasian is particularly famous because it was during his reign that the construction of the Roman Colosseum started, although he did not live long enough to see it completed. He became the emperor after a year of civil war following the suicide of Nero in 68 AD. Between him and Nero, there were two emperors of ancient Rome, Galbo and Otho, who ruled just for a few months. Vespasian reformed the financial system of Rome and started several ambitious construction projects, The Roman Colosseum being one of them. Among the so-called ‘Five Good Emperors’ of ancient Rome, Marcus Aurelius was the most famous one. He ascended to the throne after the death of Antoninus Pius and ruled the Roman Empire from 161 AD to 180 AD with Lucius Verus acting as the co-emperor from 161 AD to 169 AD. He suppressed various revolts in the Empire and led a long campaign against the Germanic tribes of North. Marcus Aurelius is famous for his stoic philosophy and his book, Meditations, is considered a masterpiece of philosophy of service and duty. The Ancient Roman Empire was one of the most magnificent and largest empires of history. At its peak, the empire stretched over three continents and consisted of diverse regions and ethnicities. The emperors of Ancient Rome were the most powerful individuals in the empire and acted as the ultimate authority. 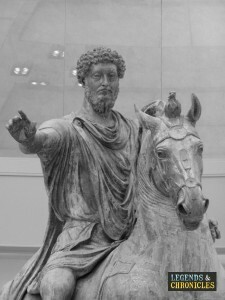 There were many emperors who ruled the empire as a duty, such as Marcus Aurelius, while there were those who merely indulged in luxury without paying much attention to the management of the empire. These emperors of ancient Rome hailed from various dynasties, most famous of which are the Julio-Claudian Dynasty, Flavian Dynasty, and Antonine Dynasty.